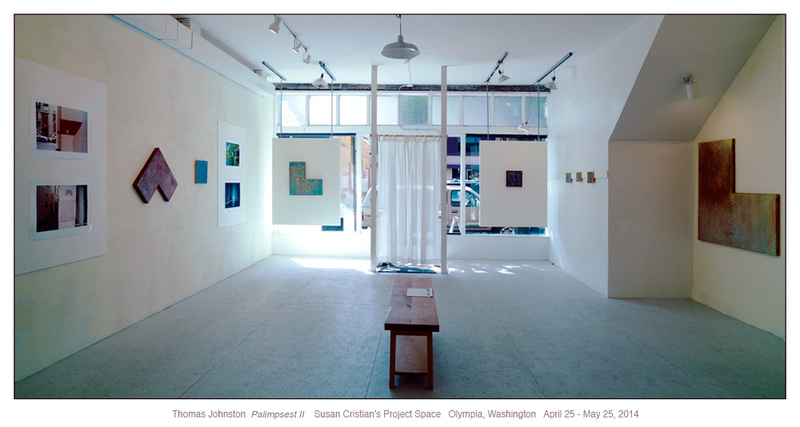 Panorama view of the installation, an exhibition of my paintings and photographs at Susan Christian’s Project Space, aka, Salon Refu. 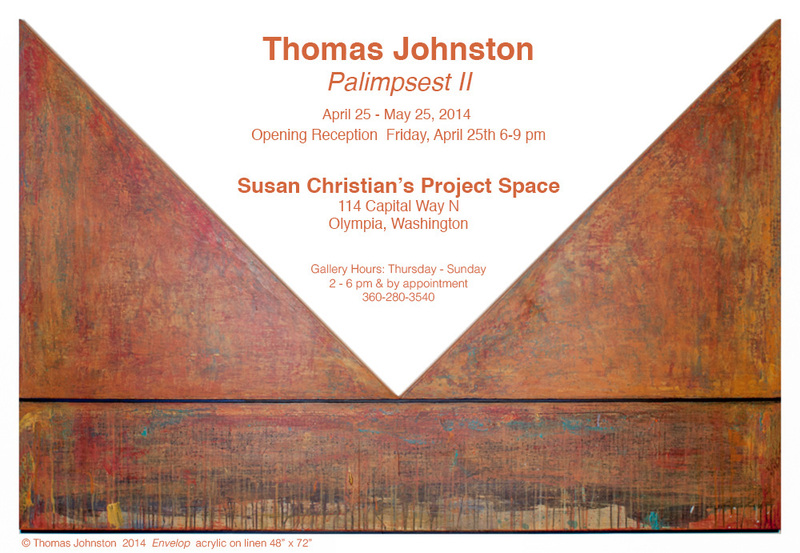 Palimpsest II was an exhibition during the spring of 2014; it explored the relationship between my paintings, photographs, and etchings. 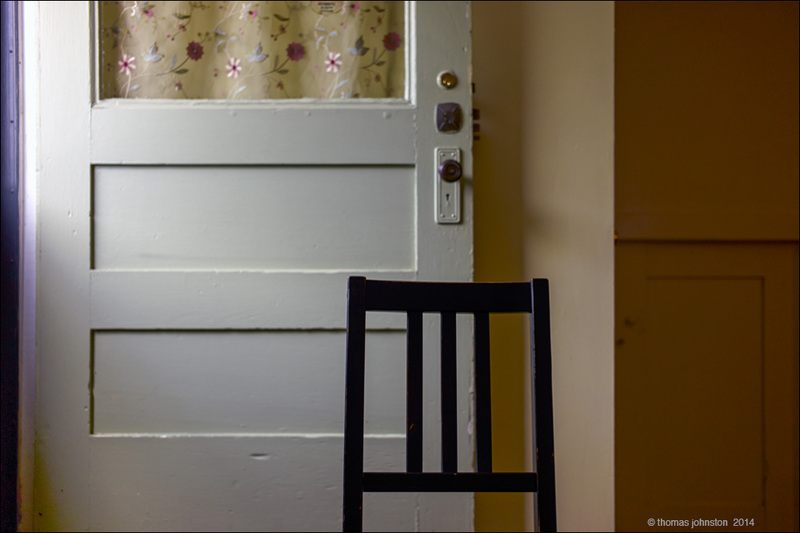 Evidence of time is embedded in the surfaces that have been worked and reworked, sometimes for years, whether in a painting or captured in a photograph. My Palimpsest paintings and etchings were first exhibited with Judy Ireland and Marcia Brookbank at their IXL Gallery on Portrero Hill in San Francisco. This is the first time photographs were exhibited together with the paintings and etchings. Some of the artworks can now be viewed here or on my Tumblr blog. An arrangement of light on color and shape in shallow space. A picture I refer to as watching light on dry paint. Like many of my compositions, it took several attempts to arrange and capture the elements in the right balance and relationship to each other, beginning with the placement of the foreground object to set up the depth of the space, and dividing the shapes into horizontal and vertical forms. Sharp focus contrasts against the soft out of focus cool color which emerges from the warmth of the shadows. Another version is included in the Urban Notes post. Last week I was in the Bay Area. Saw some good exhibits in Oakland, at the Museum of California and some of the newer galleries around 23rd and 25th. In San Francisco on one block of Geary, there were three beautiful shows, first at #49, Katy Grannan’s new work, The 99 at Fraenkel, and upstairs at Haines, John Chiara’s photographs, de • tached. Across the street at Paule Anglim at #19, I was able to have a preview of Carrie Mae Weems new show Subject and Witness while it was being installed. This beautiful show runs through April 18th.